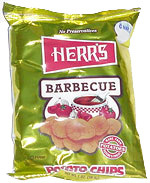 Taste test: These are extremely flavorful barbecue chips, especially the ones that are heavily seasoned (the seasoning level varies quite a bit from chip to chip in this bag, so you might want to shop around before grabbing a chip). There's a good deep barbecue taste as you eat them. Surprisingly, however, there's no major aftertaste. These aren't hot chips by any means.